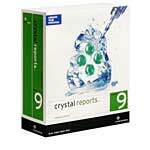 for Crystal Reports 8, 9, 10, XI or 2008 ? Check out the CRChart Developer Edition. Powerful report creation and distribution. With Crystal Reports 9, creating compelling views of business data is easier and faster than ever before. Crystal Reports 9 introduces several innovative solutions for increased power and productivity in report design and web delivery. More than 50 new features and enhancements are provided in this latest release! With Custom Templates, you no longer have to format each individual report. Use the standardized formatting and logic of Custom Templates to quickly create and apply a consistent look and feel across multiple reports. Choose between exporting just the data or the fully formatted report to Excel. Crystal Reports 9 introduces a new, richer export to Excel with support for images – the resulting file looks exactly the same as the original report. Create compelling views of data faster and more easily than ever before. The redesigned Report Creation Wizard simplifies common reporting tasks and streamlines more complex functionality into the Experts. The user interface has also been enhanced to make designing reports more intuitive. Display information across time with new Gantt charts or as points on a dial with new Gauge charts. Highlight figures past a threshold value using conditional formatting. For example, if peach sales pass 10,000 units this quarter, the chart can automatically highlight the unit sales on the peaches bar in orange. Crystal Reports now supports vector-based images. Zoom in on charts, maps and other images without affecting the sharpness of the image. Edit SQL directly for unlimited control over database connectivity. Specify database connections and create parameterized SQL commands to perform any query your database supports. With full support for Unicode strings, you can display data stored in virtually any language as well as present multiple languages in a single report. Store and maintain key report objects - including SQL commands, images, custom functions, and text objects – in a central library for faster report development. You can then reuse, share and update popular report objects from a single place for faster report design and maintenance. The Crystal Repository also enables single point updating - update the component once and the change is available across all reports. Spend less time creating and maintaining formulas. The Formula Workshop, an enhancement to the Crystal Reports Formula Expert, is a central place to develop and maintain formulas and custom functions. It includes a new codeless Wizard, enhanced error tracking, and auto-complete for easier creation. The formula string limit has also been increased from 256 to 64,000 characters. Easily navigate to and find different parts of your reports in design view and easily locate hidden fields in complex reports using the new Report Explorer. All Explorers are now floatable windows that let you tailor the design environment to your own preferences. Zero-client viewer controls let you control how end users interact with reports and modify them at runtime. Automatically turn on advanced options, such as the ability to search on saved data and export the results to Microsoft Word, Excel and HTML. Let end users insert charts, tables, and other report objects into Microsoft Outlook, Word and Excel documents - and refresh* them right within the documents - using Crystal Reports' support for Microsoft Smart Tags in Office XP. Exporting to Excel has been significantly enhanced, providing excellent quality rendition from Crystal Reports. Upgrade to the new Advanced Edition to take advantage of flexible deployment licensing for web applications. New queuing capabilities are ideal for managing variable user loads in a web environment. Install and use Crystal Reports 9 on the same machine as previous versions of Crystal Reports to make migrating existing reports easier. Take advantage of the additional features and enhancements in Crystal Reports 9 with special upgrade pricing for existing Crystal Reports customers. Feature comparison PDF - Compare the features of Crystal Reports 9 to your version.